There’s an angry young white man at your area elementary and junior high and high school this morning and he has access to a gun. This is true about every high school in America. It’s true about your kid’s school and about your alma mater and the highest achieving school and the one getting flagged right now for failing to meet No Child Left Behind’s standards. It is true about Barron Trump’s school and about the poorest school in the poorest county in the poorest state. This young man is a loser. At least, he feels that way. He hears this message–that men are losing, that white men are losing because of women and people of color and immigrants–from his father, his friends, sometimes his male teachers, and all kinds of mainstream conservative media. Like most white men, he believes that he’s the victim of reverse racism. He is drawn to white supremacist websites through his misogyny. He finds friends there who agree with him, and he finds that he gets more and more validation the angrier and angrier he is. There, he is important in a way he isn’t at school. He is socially and physically awkward, like teen boys are, or he’s handsome and insecure, like teen boys are. But he’s fairly sure everything is someone else’s fault, like do boys do. He can’t get over this, though, because Fox News tells him this every moment his father blares it and the white supremacist podcasts he listens to make it even more clear: If you don’t do something, white men like you are going to be victims of a genocide. Don’t be like the Jews, who didn’t fight back and so got what they deserved. Strike first. Because his parents keep guns in their home, he can do something. Maybe today will be his day to change history. Every boy dreams of that, and boys who have been given poisonous dreams dream of violence. He plays video games, but, like most people who play video games, he can distinguish between reality and fantasy. He isn’t loading a gun into his truck this morning as a game but as an act of assertion: I matter because I can kill. He can kill because some adults secretly agree that white boys should be allowed to kill and leave their guns available to him. He listens to bizarre music that worries his parents. He participates in a bizarre subculture that is meant to scare them. He paints his face to look like an insane clown. Or he wears contact lenses that make his eyes two different but both weird colors. Or he wears a jacket with the Rhodesian flag. But this music and makeup and clothing can’t make allow him to kill someone. Only the gun his father leaves unlocked and loaded under his bed, “in case,” will do that. Sociologist Michael Kimmel gave us insight into this young man 500 school shootings ago: His rage is rooted in his “aggrieved entitlement”–the sense that the world does owe him something, because, as a white man, his is actually better than women and people of color. And, for most of Western history, he’s been received that way. Women believed it (or so they told him, even if they rolled their eyes behind his back, knowing that it wasn’t true). People of color believed it (or so he thinks, ignoring that it was his violence, not his superiority, that kept them “inferior”). Now they don’t. He can’t stand the change, even though their real loss of power isn’t due to women or people of color. They hate because they fear, and they fear becasue they feel that the deepest feelings of their lives are being assaulted and outraged. And they do not know why; they are powerless pawns in a blind play of social forces. As a young person, he can’t even remember the time before gender and racial equality were at least lip-service values, but he knows that the world has changed for the worse for him. In his view, the world has tipped the other direction entirely, giving women and people of color advantages white men never had, he is sure, especially if those white men were poor. He is not the only young white man to feel this way. It’s the classic profile of men who murder their wives and girlfriends, of neo-Nazis, and of school shooters. You don’t have to be crazy to believe it, and most of them young men laying their plans to shoot up a school or a mall or a movie theater today aren’t crazy. They’re simply tuned in to a culture that tells them that life is getting worse for them because of women and African Americans and Latinos and Muslims. And they have access to guns. They are skipping school today to practice target shooting and outfit trucks with cattle catchers. Eventually, he will kill your child or your child’s friend or teacher or coach or janitor or librarian. It will be Mr. Ernesto as he fixes the broken water fountain or Ms. Cammie as she scurries the pre-K class from the playground. These are my children’s teachers. Some of them are going to die. You have probably seen (maybe argued with) someone on the internet in the last few days who lament that it’s the person, not the gun. It’s the sin in our hearts, not the gun. Yet they have no plan to address the person or the sin. This is because the gun and the person and their sin are all from the same source: white men’s fear of a changing world, their rage at it, their entitlement. Gun fetishists cannot be sincere in their plea that we change the hearts of mass shooters because their hearts are nurtured by the same fears and hate that nurture gun ownership itself: get rid of the aggrieved entitlement of white men and you get rid of the reason why so many people buy so many guns. This isn’t just about the economics of the gun market–though it relies heavily on racism and fear to sell guns. It’s about every day gun owners having to own up to the fact that their hearts are also wrong. The anger of gun owners and mass shooters is often just a matter of degrees. Those degrees matter–they are the difference between teenagers coming home from school with stories of their day or in grumpy teen silence and kids dying in the hallways–but to end school violence would require ending the hate and fear and entitlement that drives gun ownership. 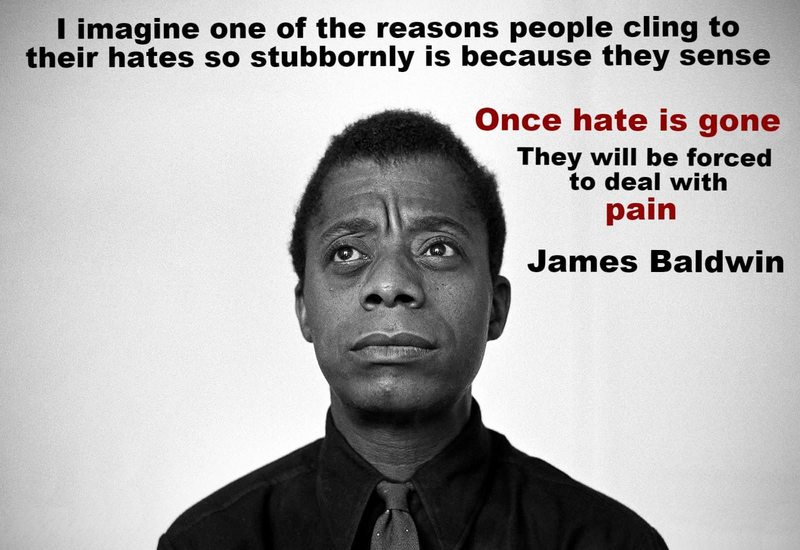 Above, James Baldwin reminds us, “I imagine one of the reasons people cling to their hates so stubbornly is because they sense, once hate is gone, they will be forced to deal with pain.” In that guns are a form of hate, they also hide pain. There are many people among us who would rather wallow in their entitlement and anger and fear–and never address their pain–than let children live. Next Next post: This week’s mass shooting targeted Jews.